Contrary to current media accounts, Mosul’s Old City is still heavily infiltrated with ISIS influence. The city was ‘liberated’ last week, but the death tolls are still growing by the day. As men, women, and children flee the city to seek refuge, ISIS is on the prowl using every opportunity to inflict harm on the innocent with starvation, shootings, and the worst of all, undercover suicide bombers. The bombings have grown so consistent the men are required to wear their shirts lifted up into their neck collars, to ensure they aren’t hiding bomb belts. However, the suicide bombers, often women, are mixed in with civilians, detonating at military check points and high traffic areas. In the midst of this chaos and pain, last week ATP received word from General Mustafa that a little girl survived a bombing and was in need of help. She was pulled from the rubble. Her parents and two other sisters were killed by ISIS. Victor and the team immediately packed up and went into deep enemy territory to collect the precious cargo. She is currently in Victor and Eileen’s safe keeping, alongside her older sister and also Baby Ali. They are getting them the medical treatment and trauma rehabilitation they require. More updates on these sweet children will be available shortly. While the ATP team was in route to reach the little girl, they were asked to also assist Emad, a 13 year old boy. 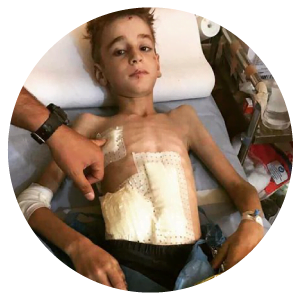 Emad was in need of immediate medical treatment for infection caused from severe shrapnel wounds in his abdominal cavity. Sadly, they believe his mother was abducted from ISIS and they fear she may not be alive and his father was killed. Victor went to Facebook to ask for your help for Emad’s medical needs and God provided. Many responded and provided funds totaling over $11,000.00 with one donor giving $5000.00. When they originally reached the hospital the doctors were concerned that surgery might be required. 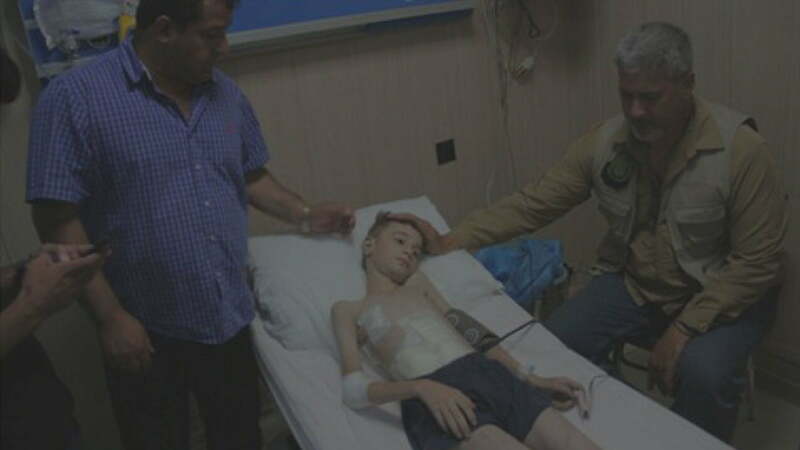 Now Emad is recovering well and surgery is no longer needed. He has since been relocated to his extended family’s home and will be able to receive the long-term treatment and the recovery he needs, thanks to the support of these generous donors. This has truly been one of the most intense weeks for Team ATP. In the short time left for this mission, there is still much work to be done. The team will be visiting a few more Internally Displaced People Camps, sharing God’s love with the people and local media while distributing the remaining sponsored Lion and the Lamb Life Packs. When the team returns to the United States they will debrief and explore the next stage of this ministry in Iraq. Won’t you help Victor and Eileen finish strong? For this mission, there are still approximately 2,778 children in need of Lion and the Lamb Life Pack Sponsorships. It only costs $30 to provide one child with a Lion and the Lamb Life Pack. These trauma packs include a huggable stuffed lion or lamb animal, with prayers and songs in their native language, crayons, coloring book with Victor’s testimony, and small first aid kit, all housed in a multi-purpose drawstring bag. Please support the ATP mission by donating below. Thanks all for the love and support! More updates coming soon! For now, Baby Ali sends his love.